Along with children safety comes a realm that most parents don't even know of. You know it's safest to keep your child harnessed for as long as possible, but did you also know that wearing a winter jacket under that harness is VERY unsafe and can potentially be deadly? A puffy jacket compresses in a crash and can fling the child out of the seat if the harness straps are loosened enough. If you have to loosen the straps to get your child in the seat than that jacket is NOT ok to be worn. Sweatshirts are fine and thinner jackets are okay as well, but big puffy winter jackets are unacceptable. So what is the solution? Well you could take off your child's jacket, strap them in and cover them with either a blanket or their jacket on backwards OR you can get a Car Seat Poncho Like those made my Mouse House Creations. She made Avery a custom reversible poncho and I'm in LOVE!! She asked for Avery's height and asked where I wanted it to hit on her legs. I wanted it big so I could get 2 years out of it. And this is what I got! I'm so in love with it. She added the pocket to the reverse side so her hands can keep warm. The child can stick their arms out the bottom and put them in the pocket, however, it's a little big on Avery and she can't do that. Now it looks intimidating, I know. Basically before putting Avery in her seat, I have her face me (standing on the ground) I pick up the back of the poncho, grab her under her arm, place in seat, and buckle her in. 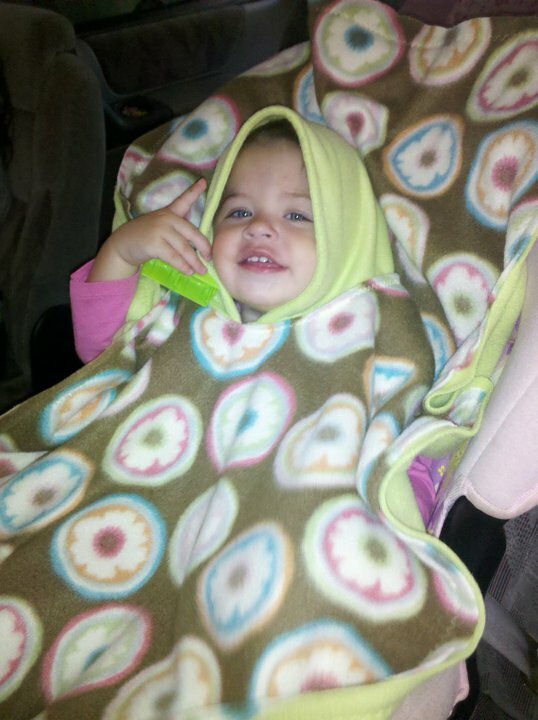 The back of the poncho lays over the back of the seat and the straps go underneath. This is double layer fleece IT IS WARM ENOUGH! Sometimes I put Avery's spring jacket on first, then this over. So the straps buckle over her spring jacket. It is fleece lined so keeps her a tad warmer. I have gotten so many compliments on this poncho and I will buy another one when she outgrows this one. I was going to get pictures of her in it in the car, but It's just too cold to torture her like that. Think 14 degrees BRRR. Here is a photo from online that shows how it lays over the seat. Much Safer and in my opinion warmer as it covers most of the legs too!!! 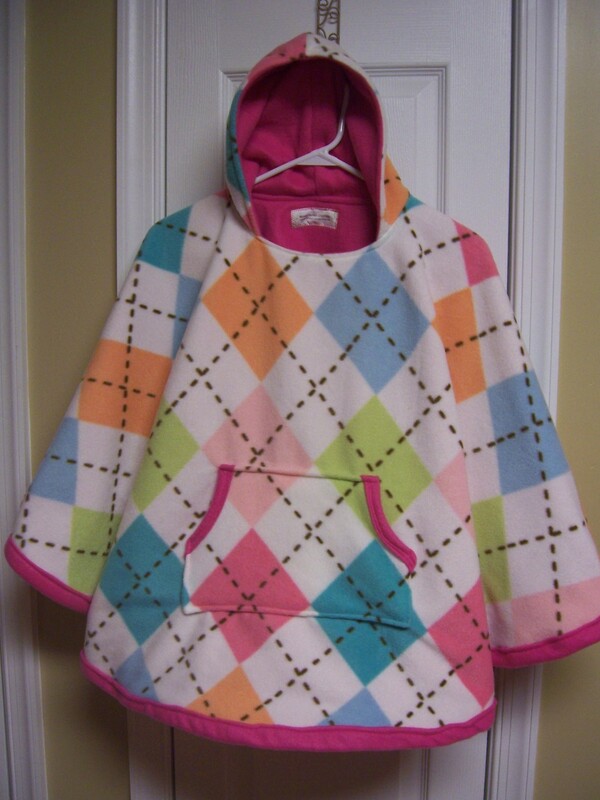 Price: Mouse House charges about $42 for a completely custom poncho. This is worth it. Overall: ***** Love it, Avery likes it too. It's super easy to slip on and off (easier than a zipper jacket is) and she's gotten tons of compliments on it. Most of all It's all about her safety! I also like the Custom Fleece Slouchy Boots. I love the little birthday dress as well as the music necklace (and everything else- she's in my Etsy favorites already!). I LOVE the slouchy fleece boots! I love the fleece slouchy boots. I also love her marker rolls! and followed Mouse House Blog! My E-mail is Bsu07j2911 @ yahoo dot com! I follow your blog!!! I love the background by the way. I follow MHC's blog via GFC. I love her slouchy fleece boots! I follow Mouse House blog! Following Mouse house creations' blog! Link to my blog post! I am feed burner subscriber!! I LOVE the cupcake wrappers on her site!! Ilove these custom fleece slouchy boots. I love the slouchy boots at mouse house etsy! Seriously, this is a terrific idea. I could use a few of these ponchos!! I also think her birthday banners are really cute. I love the "Farm Party" Birthday dress. (1) I just voted for you on picket fence blogs. (2) I just voted for you on picket fenceblogs. (3) I just voted for you on picket fence blogs. (4) I just voted for you on picketfenceblogs. (5) I just voted for you on picket fence blogs. I like the slouchy boots! They look so warm! I like her cute cupcake toppers! I follow the Mouse House creations blog! love, love, love the bird cupcake wrappers!!! I absolutely love all the cupcake stuff she has. I am not creative at all in that sense! I LOVE the fleece slouchy boots. Super cute. I follow "Welcome to the Mouse House"
Love the fleece boots, too cute! Tweeted/linked this giveaway on Twitter! I also like the Baby Shower Cupcake wrappers.